So it is, dear descendants of Alexander Veniaminovich! The evening dedicated to our common ancestor is scheduled for May 24, Wednesday, at 18 o’clock at the House of the Russian Diaspora in Taganka Square, Moscow. There will be invitations. Write here, who and how many people are coming, or send me a personal message. Bring the children! Значит так, дорогие потомки Александра Вениаминовича! Вечер, посвященный общему нашему родственнику, намечается на 24 мая, в среду, в 18 часов в Доме русского зарубежья на Таганке. Будут пригласительные билеты. Пишите сюда, кому сколько или мне в личку. Приводите детей! This is one of the photographs saved from the police in suitcases for 100 years. Only now has it been revealed. A map shows each country’s current second language. Saudi Arabia’s is Tagalog. Russia in 1921, as represented at a conference of London trade unionists, held in the Friars Hall, Blackfriars Road, London, held on May 7 of that year. Here, the report’s author visits Russia. Volin’s anarchist analysis of the Revolution. Red Army in Tblisi, 1921, and a parade on Red Square in 1917. 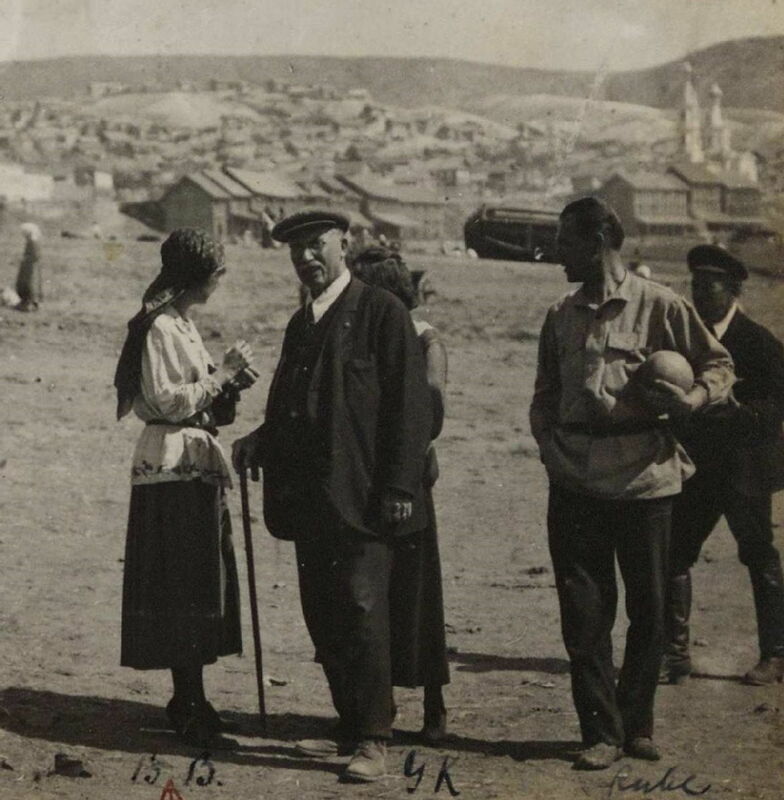 Butyrskaya, where four of my relatives were held in 1921. Aizenman was in a labor camp near Moscow. Later Voskresensky (one of the four mentioned above) was required to work in some type of prison, also near Moscow. Famine was bad in that year and to me things in Russia look terrible before, during, and after the Revolution, as well as now. From Riga in 1921, Emma Goldman said her stay in Russia had convinced her that anarchism was the only sound system. Seven new planets and a new star. Some detention letters for my relatives. Here is one and there is another. They are for Aleksandr Voskresensky and my cousin Lydia Voskresenskaya, and her sister Eugenia Nersessova and her husband. In November, 1921 they were arrested and held in Butyrskaya Prison until December. The site the letters are on seems to be about political prisoners 1918-1922 and 1922-1938. It is very inconvenient not to read Russian. This is a current photograph of the house in Kazan where my cousins Anya Alexandrovna Bari and Alexander Filippovich Samoilov lived from 1910-1930. As you see, it has a plaque. During the Russian Civil War the Samoilovs’ twin sons, Alexander Veniaminovich’s first grandchildren, walked to Shanghai with the Czech batallions and sailed to San Francisco, where my great-aunt Valeska met them on the docks and put them on a train to Harvard. Samoilov could have come as well and some thought he should have done, but he had research in course that he did not want to abandon. He was awarded the Lenin Prize in 1930, as was Alexander Veniaminovich’s business associate Vladimir Shukov also. Samoilov worked with Pavlov, Nobel Prize 1904. I have very brilliant cousins. I am working on things related to this post, and it is taking up time formerly devoted to blogging. Keywords here are Benjamin Matveevich Bary and Matvee Bary. Benjamin was “a hot opponent of Talmudism,” as it was said by one Russian official who turned him down for a job as a kind of commissioner of Jewish affairs. He had converted to Christianity, and thought everyone should. “Humboldt was, in general, against baptism [conversion of Jews]; see Bulletin of Russian Jews 24 (1871).” Nonetheless, he recommended Benjamin for that job in St. Petersburg. I would like to know who Matvee was and what his relationship with Benjamin was like.